For old-fashioned holiday fun, head to Manassas for the city’s Christmas Parade (starting from 9022 Mathis Ave., Manassas, Va.) for a day of floats, live performances, marching bands and giant balloons. Kids can enjoy photo ops and Christmas storytelling as Saint Nick makes a special appearance. Also, the city’s tree lighting ceremony is the night before, Friday, Dec. 2, at the Manassas Museum at 6:30 p.m., you can shop for gifts at the Old Town Manassas Open House on Sunday Dec. 4, from noon to 5 p.m. Parade begins at 10 a.m.; free admission. Head to horse country for Middleburg's Christmas Celebration, featuring its iconic hunt review, in a day-long event (starting at 2 East Washington St., Middleburg, Va.) full of animals, floats and marching bands. Watch as mounted riders clad in red coats take to the 18th century village’s streets on 100+ horses, with dozens of hounds trailing behind them. Other activities throughout the day include a craft show, flower and greens show, and hayrides. Vino enthusiasts can rejoice, because the parade features its first-ever progressive wine tasting bar tour. Events throughout the day last from 8:30 a.m.-6 p.m; free admission to parade. Old Town's annual Scottish Christmas walk parade kicks off the holiday season with more than 100 Scottish clans and pipe-and-drum bands, plus Scottish dancers, dog groups, dignitaries and Santa. as they march their way throughout the historic neighborhood. The two-day celebration is consistently ranked by the Southeast Tourism Society as one of the top 20 events in the South, and includes the chance to have a Taste of Scotland at George Washington Masonic Memorial (101 Callahan Drive) on Fri., Dec. 2 and a walk parade (beginning at the corner of Wilkes and South Saint Asaph Streets) on Sat., Dec. 3. Taste of Scotland, 8 -11 p.m.; $75-$275. Parade, 11 a.m.-1 p.m.; free admission. Head to the Alexandria marina (behind the Torpedo Factory Art Center at 105 N. Union St.) for the Holiday Boat Parade of Lights to watch the harbor sparkle and shine. Fifty 50 powerboats and sailboats -- led by Alexandria fireboat "Vigilant" and D.C. fireboat "John Glenn" -- take to the water, decked out in holiday decorations. Watch as the boats compete for Best in Show and Best Thinking Outside the Christmas Box, among others. 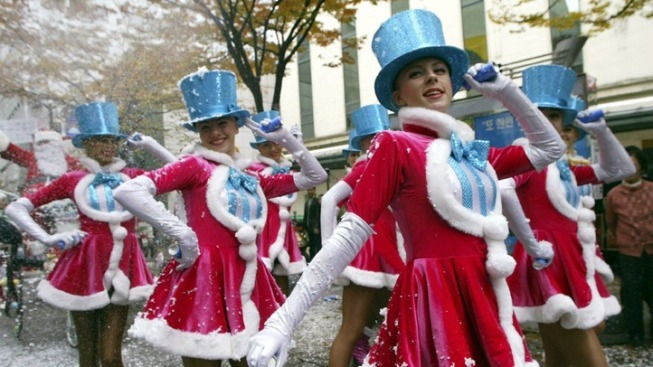 Go early for live performances and Santa’s arrival by boat. 4-7 p.m.; free admission. Leesburg's Christmas and Holiday Parade (beginning at Ida Lee Drive, Leesburg, Va.) features live music and seasonal floats. Rock out to edgier updates of holiday tunes at the festival’s Jingle Jam concert, featuring local artists. The concert has three separate shows, with one especially for kids. Tickets from the concert benefit the Juvenile Diabetes Research Foundation. 10 a.m.; free admission to parade; $5 for Junior Jam concert; $15 for Jingle Jam (must be purchased in person). Gather at your favorite viewing spot with friends and family near Annapolis Harbor (1 Dock St., Annapolis, Md.) and watch as boat owners show off their favorite watercrafts decked out in Christmas light decorations during the Annapolis Christmas Light Boat Parade. The parade, held by the Eastport Yacht Club, is an annual holiday tradition. 6-8 p.m.; free admission.